A photo of the Aussie Drop, where James Garner fell off a 250-foot cliff this past weekend. Bridger-Teton Avalanche Center photo. ARTICLE CORRECTION, Friday, March 13th: Following communication with the victim, James Garner, directly, we’d like to offer some corrections to our prior article about the incident. According to Mr. Garner, he was not, as we said in our original story below, taking a selfie or any other photo for that matter at the time of the incident, and claims instead that he was simply sitting along the edge of the High Traverse trail at Grand Targhee resting with some friends when the cornice below them broke and sent him hurtling down the backside of the mountain and down the Aussie Drop slide path, quickly terminating in a 250-foot free fall off a closeout cliff. On Thursday February 12, 2015 at approximately 2:20pm it was reported to the Grand Targhee Resort Ski Patrol that someone had fallen off a cornice. Grand Targhee Resort Ski Patrol responded to the scene and observed several sets of boot tracks leaving the resort boundary under a rope closure near the top of the Blackfoot lift. Ski Patrol was able to contact two guests who had left the ski area boundary, and were informed and observed that a third guest had broken through the cornice, caused an avalanche and slid approximately 800 feet. Ski Patrol was able to verbally and visually contact the party caught in the slide outside of the Resort boundary, and immediately implemented a recovery plan. Teton County, WY Search and Rescue, Air Idaho, the Teton County, WY Sheriff, and the US Forest Service were all notified of the incident. Air Idaho and the Teton County, WY Sherriff responded to the Resort, and Grand Targhee Ski Patrol and Teton County, WY Search and Rescue responded to the scene. The guest was successfully rescued and transported to the Driggs Memorial Hospital by 5:00pm. An investigation is ongoing and no further details are available at this time. 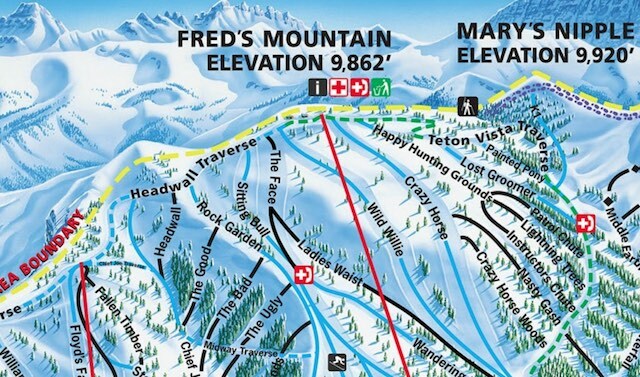 The Headwall Traverse trail, on the edge of which James Garner says he was resting when the cornice below him broke, can be see between the Blackfoot and Dreamcatcher chairlifts on the Grand Targhee trail map. Mr. Garner asserts that there was no signage indicating the hazard lurking right nearby or the immense cliffs. Early reports that Mr. Garner had escaped unscathed and walked out under his own power appear to be inaccurate, and he asserts that, in fact, he suffered injuries from which we will be recovering for quite awhile, and that he was evacuated from the scene via helicopter. The citation he was initially faced with for trespassing on closed lands was apparently dismissed as well. We wish James the best of luck in his recovery. A skier removed his skis and walked into closed area and onto an unsupported cornice which failed. He fell 800 to 1,000 feet through cliffs including a 250 foot free fall and sustained injury. 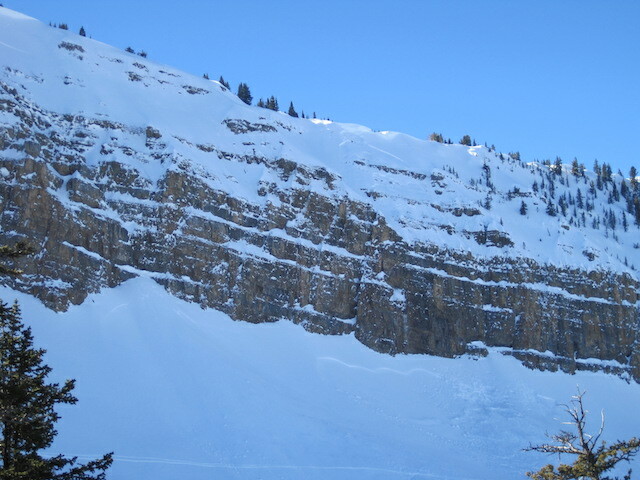 The cornice debris triggered some small slab avalanches along the way in the cliffs. The more extensive report by the JH News & Guide revealed that Garner had snuck under a boundary rope at Targhee near the Blackfoot chairlift to take a photo of the Tetons when the cornice he was unwittingly standing on broke underneath him, triggering a two-foot deep slab avalanche on a 45-degree slope that carried Garner over multiple cliff bands on a slide path ironically known as the Aussie Drop, including a final 250-foot drop onto the apron below. Somehow (in the name of all that is reasonable and possible), Garner survived the mind-boggling tumble unscathed, and was responsive verbally to ski patrol as they communicated with him from above. See also: This is Why You Stay the HELL Away From Cornices! !